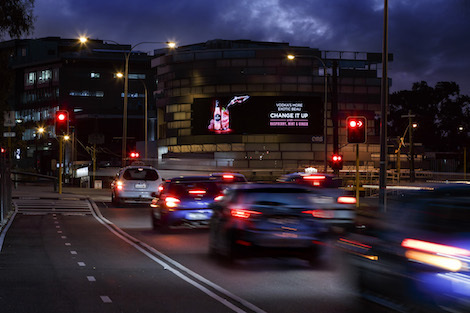 QMS continues to expand its landmark digital portfolio across Western Australia, switching on ‘The Leeder,’ an iconic digital billboard in the heart of Perth. Following the launch of two new digital billboards in the major WA regional centres of Bunbury and Kalgoorlie in recent months, ‘The Leeder’ further delivers on QMS’ digital expansion strategy out West. Positioned at the gateway to the affluent western suburbs, ‘The Leeder’ and its unique wraparound structure, impacts more than 1.3 million contacts travelling through this major intersection that acts as a feeder to the Mitchell and Graham Farmer Freeways. Its close proximity to popular food and retail hubs and Subiaco’s Domain stadium, provides advertisers with an exclusive opportunity to target both a young, affluent audience as well as highly engaged sports fans. Inaugural advertisers on ‘The Leeder’ include Audi, Cascade, Sirena Tuna, AGL and Network Ten. This entry was posted on Thursday, October 19th, 2017 at 07:24 @350 and is filed under Scuttlebut. You can follow any responses to this entry through the RSS 2.0 feed. You can leave a response, or trackback from your own site.